The text follows the Taisho Tripitaka edition, vol. 12, and the passage numbers follow Jodoshinshu Seiten, 1988, pp. 87-117. Thus have I heard. At one time the Buddha was staying on the Vulture Peak in Rajagriha [341a] with a large assembly of twelve hundred and fifty monks. He was also accompanied by thirty-two thousand bodhisattvas led by Manjushri, the Dharma Prince. At that time, in the great city of Rajagriha, there was a prince named Ajatashatru. 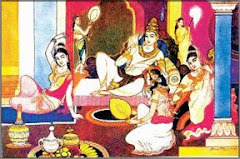 Instigated by his wicked friend, Devadatta, he seized his father, King Bimbisara, confined him in a room with seven-fold walls, and forbade all the court officials to visit the king. Vaidehi, the king's consort, was devoted to him. After having bathed and cleansed herself, she spread over her body ghee and honey mixed to a paste with wheat flour, filled her ornaments with grape juice and secretly offered this food and drink to the king. He ate the flour paste and drank the juice and then asked for water. Having rinsed his mouth, he joined his palms in reverence and, facing the Vulture Peak, worshipped the World-Honored One from afar, said, "Mahamaudgalyayana is my close friend. I beseech you to have pity on me and send him here to give me the eight precepts." Then Mahamaudgalyayana flew as swift as a hawk to the king. Day after day he came like this to give him the eight precepts. The World-Honored One also sent the Venerable Purna likewise to the palace to expound the Dharma to the king. Three weeks passed in this way. Because he had eaten the flour-paste and heard the Dharma, he appeared peaceful and contented. Then Ajatashatru asked the guard, "Is my father still alive?" The guard replied, "Great king, his consort spreads flour paste over her body and fills her ornaments with grape juice and offers these to the king. The monks Mahamaudgalyayana and Purna come here through the air to expound the Dharma to him. It is impossible to stop them." Hearing this, Ajatashatru became furious with his mother and said, "Because you are an accomplice to that enemy, mother, you too are an enemy. Those monks are evil, for with their delusive magic they have kept this wicked king alive for many days." So saying, he drew his sharp sword, intending to kill her. At that time the king had a minister named Candraprabha who was intelligent and wise. Together with Jivaka he made obeisances to the king and said, "Great King, according to a certain Vedic scripture, since the beginning of this cosmic period, there have been eighteen thousand wicked kings who have killed their fathers out of their desire to usurp the throne, but we have never heard of anyone who has committed the outrage of killing his mother. Your Majesty, if you commit such an outrage, you will bring disgrace upon the ksatriya class. As your ministers, we cannot bear to hear what people will say. As this would be the act of an outcaste, we could no longer remain here." Having spoken these words, the two ministers grasped their swords and stepped back. Agitated and frightened, Ajatashatru said to Jivaka, "Are you not on my side?" Jivaka replied, "Your Majesty, please restrain yourself and do not kill your mother." Hearing this, the king repented and begged their forgiveness. [341b] Having thrown away his sword, he stopped short of killing his mother and, instead, ordered the court officials to lock her in an inner chamber and not to allow her to leave. Vaidehi, thus confined, grew emaciated with grief and despair. Facing the Vulture Peak, she worshipped the Buddha from afar and said, "O Tathagata, World-Honored One, you used to send Ananda to comfort me. Now I am in deep sorrow and distress. Since there is no way of my coming to look upon your august countenance, World-Honored One, I pray you send the Venerable Mahamaudgalyayana and the Venerable Ananda here to see me." When she had said these words, tears of sorrow streamed down her cheeks like rain. Then she bowed towards the Buddha in the distance. 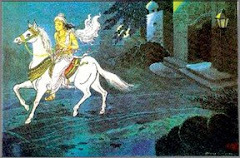 Even before she raised her head, the World-Honored One, who was then staying on the Vulture Peak, knew Vaidehi's thoughts and immediately ordered Mahamaudgalyayana and Ananda to go to her through the air; he himself disappeared from the mountain and reappeared in the inner chamber of the royal palace. 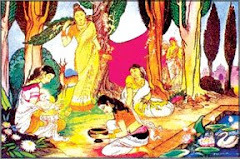 After worshipping him, Vaidehi raised her head and saw Shakyamuni Buddha, the World-Honored One. He was the color of purple gold and was seated upon a lotus-flower of a hundred jewels. He was attended by Mahamaudgalyayana on his left and Ananda on his right. Shakra, Brahma, the guardian gods of the world and other devas were in the air about him. Scattering heavenly blossoms like rain, they paid homage to the Buddha. When she saw the World-Honored One, Vaidehi tore off her ornaments and prostrated herself on the ground. Weeping bitterly, she said to the Buddha, "O World-Honored One, what bad karma did I commit in former lives that I have borne such an evil son? I wonder, World-Honored One, what karmic relations could have made you a relative of Devadatta? "I beseech you, World-Honored One, to reveal to me a land of no sorrow and no affliction where I can be reborn. I do not wish to live in this defiled and evil world of Jambudvipa where there are hells, realms of hungry spirits, animals and many vile beings. I wish that in the future I shall not hear evil words or see wicked people. World-Honored One, I now kneel down to repent and beg you to take pity on me. I entreat you, O Sun-like Buddha, to teach me how to visualize a land of pure karmic perfection." Then the World-Honored One sent forth from between his eyebrows a flood of light, which was the color of gold and illuminated the innumerable worlds in the ten quarters. Returning to the Buddha, the light settled on his head and transformed itself into a golden platform resembling Mount Sumeru. On the platform appeared the pure and resplendent lands of all the Buddhas in the ten quarters. Some of these lands were made of seven jewels, some solely of lotus-flowers; some resembled the palace in the Heaven of Free Enjoyment of Manifestation by Others, while some were like a crystal mirror in which all the lands in the ten quarters were reflected. Innumerable Buddha-lands like these, glorious and beautiful, were displayed to her. Vaidehi then said to the Buddha, "O World-Honored One, these Buddha-lands are pure and free of defilement, and all of them are resplendent. But I wish to be born in the Land of Utmost Bliss of Amitayus. I beseech you, World-Honored One, to teach [341c] me how to contemplate that land and attain samadhi." The World-Honored One smiled, and from his mouth came five-colored rays of light, each shining on King Bimbisara's head. Although the old king was confined, with his unhindered mind's eye he saw the World-Honored One in the distance. He knelt down in homage to the Buddha and effortlessly made spiritual progress until he reached the Stage of a Non-returner. Then the World-Honored One said to Vaidehi, "Do you know that Amitayus is not far away? Fix your thoughts upon and contemplate that Buddha-land, then you will accomplish the pure acts. I shall describe it to you in detail with various illustrations, so that all ordinary people in the future who wish to practice the pure karma may also be born in that Western Land of Utmost Bliss. Whoever wishes to be born there should practice three acts of merit: first, caring for one's parents, attending to one's teachers and elders, compassionately refraining from killing, and doing the ten good deeds; second, taking the three refuges, keeping the various precepts and refraining from breaking the rules of conduct; and third, awakening aspiration for Enlightenment, believing deeply in the law of causality, chanting the Mahayana sutras and encouraging people to follow their teachings. These three are called the pure karma." The Buddha further said to Vaidehi, "Do you know that these three acts are the pure karma practiced by all the Buddhas of the past, present and future as the right cause of Enlightenment?" The Buddha said to Ananda and Vaidehi, "Listen carefully, listen carefully and ponder deeply. I, the Tathagata, shall discourse on pure karma for the sake of all sentient beings of the future who are afflicted by the enemy, evil passions. It is very good, Vaidehi, that you have willingly asked me about this. Ananda, you must receive and keep the Buddha's words and widely proclaim them to the multitude of beings. I, the Tathagata, shall now teach you, Vaidehi, and all sentient beings of the future how to visualize the Western Land of Utmost Bliss. By the power of the Buddha all will be able to see the Pure Land as clearly as if they were looking at their own reflections in a bright mirror. Seeing the utmost beauty and bliss of that land, they will rejoice and immediately attain the insight into the non-arising of all dharmas." The Buddha said to Vaidehi, "You are an unenlightened, and so your spiritual powers are weak and obscured. Since you have not yet attained the divine eye, you cannot see that which is distant. 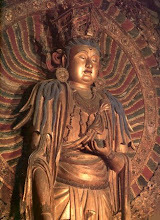 But the Buddhas, Tathagatas, have special ways to enable you to see afar." Vaidehi said to the Buddha, "World-Honored One, through the Buddha's power, even I have now been able to see that land. But after the Buddha's passing, sentient beings will become defiled and evil, and be oppressed by the five kinds of suffering. How then will those beings be able to see the Land of Utmost Bliss of Amitayus?" The Buddha said to Vaidehi, "You and other sentient beings should concentrate and, with one-pointed attention, turn your thoughts westward. How do you contemplate? All sentient beings [342a] except those born blind--that is, all those with the faculty of sight--should look at the setting sun. Sit in the proper posture, facing west. Clearly gaze at the sun, with mind firmly fixed on it; concentrate your sight and do not let it wander from the setting sun, which is like a drum suspended above the horizon. Having done so, you should then be able to visualize it clearly, whether your eyes are open or closed. This is the visualizing of the sun and is known as the first contemplation. To practice in this way is called the correct contemplation, and to practice otherwise is incorrect." The Buddha said to Ananda and Vaidehi, "After you have accomplished the first contemplation, next practice visualization of water. Envision the western quarter as entirely flooded by water. Then picture the water as clear and pure, and let this vision be distinctly perceived. Keep your thoughts from being distracted. After you have visualized the water, envision it becoming frozen. After you have visualized the ice as transparent to its depth, see it turning into beryl. When you have attained this vision, next imagine that the beryl ground shines brilliantly, inside and out, and that this ground is supported from below by columns, which are made of diamond and the seven jewels and hung with golden banners. These columns have eight sides and eight corners, each side being adorned with a hundred jewels. Each jewel emits a thousand rays of light, each ray in turn having eighty-four thousand colors. As they are reflected on the beryl ground, they look like a thousand kotis of suns, so dazzling that it is impossible to see them in detail. "On this beryl ground, golden paths intercross like a net of cords. The land is divided into areas made of one or the other of the seven jewels, so the partitions are quite distinct. Each jewel emits a flood of light in five hundred colors. The light appears in the shape of a flower or a star or the moon; suspended in the sky, it turns into a platform of light, on which there are ten million pavilions made of a hundred jewels. Both sides of this platform are adorned with a hundred kotis of flowered banners and innumerable musical instruments. As eight pure breezes arise from the light and play the musical instruments, they proclaim the truth of suffering, emptiness, impermanence and no-self. This is the visualizing of the water and is known as the second contemplation. "When you have attained this contemplation, visualize each object quite clearly without losing the image, whether your eyes are closed or open. Except when sleeping, always keep it in mind. To practice in this way is called the correct contemplation, and to practice otherwise is incorrect." The Buddha said to Ananda and Vaidehi, "When the visualization of the water has been accomplished, it is called the general perception of the ground of the Land of Utmost Bliss. If you attain a state of samadhi, you will see this ground so clearly and distinctly that it will be impossible to describe it in detail. This is the visualizing of the ground and is known as the third contemplation." The Buddha said to Ananda, "Keep these words of the Buddha in mind, and expound this method of visualizing the ground for the benefit of the multitude of future beings who will seek emancipation from suffering. If one has attained a vision of the ground of that land, the evil karma which one has committed during eighty kotis of kalpas of Samsara will be extinguished, and so one will certainly be born in the Pure Land in the next life. Do not doubt this. To practice in this way is called the correct contemplation, and to practice otherwise [342b] is incorrect." The Buddha said to Ananda and Vaidehi, "When you have accomplished visualization of the ground, next contemplate the jewelled trees. This is how to do so. Visualize each one and then form an image of seven rows of trees, each being eight thousand yojanas high and adorned with seven-jewelled blossoms and leaves. Each blossom and leaf has the colors of various jewels. From the beryl-colored blossoms and leaves issues forth a golden light. From the crystal-colored issues forth a crimson light. From the agate-colored issues forth a sapphire light. From the sapphire-colored issues forth a green pearl light. Coral, amber and all the other jewels serve as illuminating ornaments. Splendid nets of pearls cover the trees. Between these seven rows of nets covering each tree there are five hundred kotis of palaces adorned with exquisite flowers, like the palace of King Brahma, where celestial children naturally dwell. Each of these children wears ornaments made of five hundred kotis of Shakra-abhilagna-mani-gems, which light up a hundred yojanas in all directions, like a hundred kotis of suns and moons shining together, and so it is impossible to describe them in detail. Manifold jewels intermingle, producing the most beautiful colors. "Rows of these jewelled trees are evenly arranged, and their leaves are equally spaced. From among the leaves appear wonderful blossoms which spontaneously bear fruits of seven jewels. Each leaf is twenty-five yojanas in both length and breadth. Like the celestial ornaments, the leaves are of a thousand colors and a hundred patterns. These trees have marvelous blossoms which are the color of gold from the Jambu River and spin like fire-wheels among the leaves. From these blossoms appear various fruits, as from Shakra's vase, and from the fruits issue forth great floods of light, which transform themselves into banners and innumerable jewelled canopies. 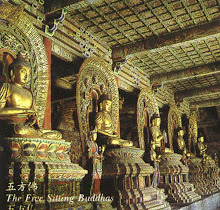 Inside the jewelled canopies can be seen reflections of all the activities of the Buddha throughout the universe of a thousand million worlds. 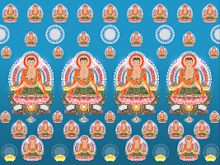 The Buddha-lands in the ten quarters are also reflected in them. "After you have seen these trees, visualize each detail in order: the trunks, branches, leaves, blossoms and fruits, and let your vision of all of them be clear and distinct. This is the visualizing of the trees, and is called the fourth contemplation. To practice in this way is called the correct contemplation, and to practice otherwise is incorrect." The Buddha said to Ananda and Vaidehi, "When you have accomplished visualization of the trees, next contemplate the ponds. This is how to do so. In the Land of Utmost Bliss, there are ponds of water possessing eight excellent qualities, each made of seven jewels which are soft and pliable. The water, springing from a wish-fulfilling king-mani-gem, forms fourteen streams. Each stream is the color of the seven jewels. Its banks are made of gold and its bed strewn with diamond sand of many colors. In each stream there are sixty kotis of lotus-flowers of seven jewels, which are round and symmetrical, measuring twelve yojanas in diameter. The water from the mani-gem flows among the flowers and meanders between the trees. As it ripples, it produces exquisite sounds, [342c] which proclaim the truths of suffering, emptiness, impermanence, no-self and of the Paramitas. Its sound also praises the physical characteristics and marks of the Buddhas. The king of wish-fulfilling mani-gem emits a splendid golden light, which transforms itself into birds with the colors of a hundred jewels. Their songs are melodious and elegant, constantly praising the virtue of mindfulness of the Buddha, the Dharma and the Sangha. 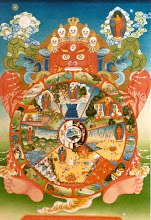 This is the visualizing of the water possessing eight excellent qualities, and is known as the fifth contemplation. To practice in this way is called the correct contemplation, and to practice otherwise is incorrect." The Buddha said to Ananda and Vaidehi, "In each region of this jewelled land, there are five hundred kotis of jewelled pavilions, in which innumerable devas play heavenly music. There are also musical instruments suspended in the sky, which, like those on the heavenly jewelled banners, spontaneously produce tones even without a player. Each tone proclaims the virtue of mindfulness of the Buddha, the Dharma and the Sangha. When this contemplation has been accomplished, it is called the general perception of the jewelled trees, jewelled ground and jewelled ponds of the Land of Utmost Bliss. This is a composite visualization and is called the sixth contemplation. "Those who have perceived these objects will be rid of extremely heavy evil karma which they have committed during innumerable kalpas and will certainly, after death, be born in that land. To practice in this way is called the correct contemplation, and to practice otherwise is incorrect." The Buddha said to Ananda and Vaidehi, "Listen carefully, listen carefully and ponder deeply. I will expound for you the method of removing suffering. Bear my words in mind and explain them to the multitude of beings." When these words were spoken, Amitayus appeared in the air above, attended on his left and right by the two Mahasattvas, Avalokiteshvara and Mahasthamaprapta. So brilliant was their radiance that it was impossible to see them in detail. They could not be compared even with a hundred thousand nuggets of gold from the Jambu River. After she had this vision of Amitayus, Vaidehi knelt down in worship at Shakyamuni's feet and said to him, "World-Honored One, through your power I have been able to see Amitayus and the two Bodhisattvas, but how can sentient beings of the future see them?" The Buddha said to Vaidehi, "Those who wish to see that Buddha should form an image of a lotus-flower on the seven-jewelled ground. They visualize each petal of this flower as having the colors of a hundred jewels and eighty-four thousand veins like a celestial painting, with eighty-four thousand rays of light issuing forth from each vein. They should visualize all of these clearly and distinctly. Its smaller petals are two hundred and fifty yojanas in both length and breadth. This lotus-flower has eighty-four thousand large petals. Between the petals there are a hundred kotis of king-mani-gems as illuminating adornments. Each mani-gem emits a thousand rays of light which, like canopies of the seven jewels, cover the entire [343a] earth. "The dais is made of Shakra-abhilagna-mani-gems and is decorated with eighty thousand diamonds, kimshuka-gems, brahma-mani-gems and also with exquisite pearl-nets. On the dais four columns with jewelled banners spontaneously arise, each appearing to be as large as a thousand million kotis of Mount Sumerus. On the columns rests a jewelled canopy similar to that in the palace of the Yama Heaven. They are also adorned with five hundred kotis of excellent gems, each emitting eighty-four thousand rays shining in eighty-four thousand different tints of golden color. Each golden light suffuses this jewelled land and transforms itself everywhere into various forms, such as diamond platforms, nets of pearls and nebulous clusters of flowers. In all the ten directions it transforms itself into anything according to one's wishes, and performs the activities of the Buddha. This is the visualizing of the lotus-throne, and is known as the seventh contemplation." The Buddha further said to Ananda, "This majestic lotus-flower was originally produced by the power of the Bhiksu Dharmakara's Vow. Those who wish to see the Buddha Amitayus should first practice this contemplation of the flower-throne. In doing so, do not contemplate in a disorderly way. Visualize the objects one by one -- each petal, each gem, each ray of light, each dais and each column. See all of these as clearly and distinctly as if you were looking at your own image in a mirror. When this contemplation is accomplished, the evil karma which you have committed during five hundred kotis of kalpas of Samsara will be extinguished, and you will certainly be born in the Land of Utmost Bliss. To practice in this way is called the correct contemplation, and to practice otherwise is incorrect." The Buddha said to Ananda and Vaidehi, "After you have seen this, next visualize the Buddha. Why the Buddha? Because Buddhas, Tathagatas, have cosmic bodies, and so enter into the meditating mind of each sentient being. For this reason, when you contemplate a Buddha, that mind itself takes the form of his thirty-two physical characteristics and eighty secondary marks. Your mind produces the Buddha's image, and is itself the Buddha. The ocean of perfectly and universally enlightened Buddhas thus arises in the meditating mind. For this reason, you should single-mindedly concentrate and deeply contemplate the Buddha, Tathagata, Arhat and Perfectly Enlightened One. "When you visualize the Buddha, you should first form his image. Whether your eyes are open or closed, perceive a jewelled image of him, who is the color of gold from the Jambu River, sitting on that flower-throne. 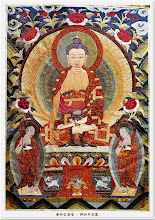 When you have perceived a seated image of the Buddha, your mind's eye will open and you will clearly and distinctly see the seven-jewelled glorious objects of the Land of Utmost Bliss, including the seven-jewelled ground, the jewelled ponds, the rows of jewelled trees covered with heavenly jewelled curtains and jewelled nets spreading over the sky. Perceive these as clearly and distinctly as if you were seeing an object in the palm of your hand. "After you have seen this image, visualize on the Buddha's left a large lotus-flower, [343b] which is exactly the same as the one described above, and then another large one on his right. Visualize an image of the Bodhisattva Avalokiteshvara sitting on the flower-seat on his left, sending forth a golden light just like the Buddha image described above, and then an image of the Bodhisattva Mahasthamaprapta sitting on the flower-seat on his right. "When you have attained this vision, you will see these images of the Buddha and bodhisattvas sending forth golden rays, which illuminate the jewelled trees. Under each tree there are also three lotus-flowers with images of a Buddha and two Bodhisattvas sitting on them, so that the land is completely filled with such images. "When you have attained this vision, you will perceive the streams, rays of light, jewelled trees, ducks, geese, male and female mandarin ducks, and so forth, all expounding the wonderful Dharma. Whether in meditation or not, you will always hear the wonderful Dharma. When you rise from meditation, you should remember what you have heard, not forget it, and confirm it with the sutras. If it does not agree with the sutras, it should be called an illusion, but if it does agree, it is called the attainment of the general perception of the Land of Utmost Bliss. This is the visualizing of the Buddha-image, and is known as the eighth contemplation. If you have attained this, the evil karma which you have committed during innumerable kotis of kalpas of Samsara will be extinguished and, while in this life, you will attain the Buddha-Recollection Samadhi. To practice in this way is called the correct contemplation, and to practice otherwise is incorrect." The Buddha said to Ananda and Vaidehi, "After you have succeeded in seeing these images, next envision the physical characteristics and the light of Amitayus. Ananda, you should realize that his body is as glorious as a thousand million kotis of nuggets of gold from the Jambu River of the Yama Heaven and that his height is six hundred thousand kotis of nayutas of yojanas multiplied by the number of the sands of the Ganges. The white tuft of hair curling to the right between his eyebrows is five times as big as Mount Sumeru. His eyes are clear and as broad as the four great oceans; their blue irises and whites are distinct. From all the pores of his body issues forth a flood of light, as magnificent as Mount Sumeru. His aureole is as broad as a hundred kotis of universes, each containing a thousand million worlds. In this aureole reside transformed Buddhas numbering as many as a million kotis of nayutas multiplied by the number of the sands of the Ganges. Each Buddha is attended by innumerable and uncountable transformed bodhisattvas. "The Buddha Amitayus possesses eighty-four thousand physical characteristics, each having eighty-four thousand secondary marks of excellence. Each secondary mark emits eighty-four thousand rays of light; each light shining universally upon the lands of the ten quarters, embracing, and not forsaking, those who are mindful of the Buddha. It is impossible to describe in detail these rays of light, physical characteristics and marks, transformed Buddhas, and so forth. But you can see them clearly with your mind's eye through contemplation. "Those who have envisioned them see all the Buddhas of the ten quarters. Because they see the Buddhas, this is called the Buddha-Recollection Samadhi. To attain this contemplation is to perceive the bodies of all the Buddhas. By perceiving these, one also realizes the Buddha's mind. The Buddhas' mind is Great Compassion. It embraces sentient beings with unconditional Benevolence. Those who have practiced this contemplation will, after death, be born in the presence of the Buddhas and realize the insight into the non-arising of all dharmas. For this reason, the wise should concentrate their thoughts and visualize Amitayus. "In contemplating him, begin with one of his physical characteristics. Visualize only the white tuft of hair between his eyebrows until you see it quite clearly and distinctly. When you visualize it, all the eighty-four thousand physical characteristics will spontaneously become manifest. When you see Amitayus, you will also see innumerable Buddhas of the ten quarters. Having visualized these innumerable Buddhas, you will receive from each the prediction of your future Buddhahood. This is the general perception of all the physical characteristics of the Buddha and is known as the ninth contemplation. To practice in this way is called the correct contemplation, and to practice otherwise is incorrect." The Buddha said to Ananda and Vaidehi, "After you have seen Amitayus clearly and distinctly, next visualize the Bodhisattva Avalokiteshvara. His height is eighty kotis of nayutas of yojanas multiplied by the number of the sands of the Ganges. His body is the color of purple-gold, and on the top of his head is a mound surrounded by an aureole with a radius of a hundred thousand yojanas, in which there are five hundred transformed Buddhas. Each transformed Buddha resembles Shakyamuni, and is attended by five hundred transformed bodhisattvas and innumerable devas. In the light emanating from his entire body are seen the sentient beings of the five realms of Samsara in all their distinct physical forms. On his head he wears a heavenly crown made of Shakra-abhilagna-mani-gems, on which stands a transformed Buddha (Amitayus) measuring twenty-five yojanas in height. "The face of the Bodhisattva Avalokiteshvara is the color of gold from the Jambu River, while the tuft of hair between his eyebrows has the colors of the seven jewels, and from it issue forth eighty-four thousand different rays of light. In each of these rays dwell innumerable and uncountable hundreds of thousands of transformed Buddhas, each attended by countless transformed bodhisattvas, all of whom manifest in various forms at will, filling completely the worlds of the ten quarters. 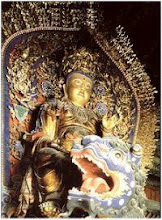 Avalokiteshvara's arms are the color of red lotus-flowers. They emit eighty kotis of exquisite [344a] rays of light in the shape of ornaments, in which are reflected all the glorious objects of that land. The palms of his hands are the color of five hundred kotis of various lotus-flowers. Each of his ten fingertips bears eighty-four thousand signs like impressed patterns, each with eighty-four thousand colors. Each color in turn emits eighty-four thousand delicate rays of light, illuminating all beings. With his jewelled hands he welcomes and guides sentient beings. "When he lifts one of his feet, the mark of a thousand-spoked wheel on its sole spontaneously changes into a pedestal, which emits five hundred kotis of light-rays. When he puts his foot down, flowers made of diamond and mani-gems are scattered everywhere. All the other physical characteristics and marks which he fully possesses are the same as the Buddha's, except for the mound on his head and the uppermost, invisible part, which are not equal to those of the World-Honored One. This is the visualization of the true physical features of the Bodhisattva Avalokiteshvara and is known as the tenth contemplation. Then the Buddha said to Ananda, "Those who wish to see the Bodhisattva Avalokiteshvara should follow the method of contemplation just mentioned. Those who practice this contemplation will not encounter any misfortune, but will be freed from karmic hindrances and rid of the evil karma which they have committed during innumerable kalpas of Samsara. If you only hear the name of this bodhisattva, you will obtain immeasurable merit. And so, how much more merit will you acquire if you clearly visualize him! Those who wish to see the Bodhisattva Avalokiteshvara should first envision the mound on his head and, next, his heavenly crown. Then they should visualize the other physical characteristics in order, as clearly as if they were looking at something in the palm of the hand. To practice in this way is called the correct contemplation, and to practice otherwise is incorrect." The Buddha said to Ananda and Vaidehi, "Next visualize the Bodhisattva Mahasthamaprapta. 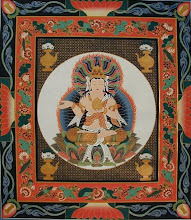 The dimensions of this bodhisattva are the same as those of Avalokiteshvara. His aureole, two hundred and twenty-five yojanas in diameter, shines to a distance of two hundred and fifty yojanas. The light emanating from his entire body illuminates the worlds of the ten quarters, making them shine like purple-gold. This light can be seen by anyone who has a close karmic relationship with him. Even if one sees the light emanating from only one pore of his skin, one can perceive the pure and glorious lights of the innumerable Buddhas of the ten quarters. This is why this bodhisattva is called Boundless Light. Furthermore, he has great power to illumine all beings with the light of wisdom in order to deliver them from the three evil realms. It is for this reason that he is also called Possessed of Great Power. "The heavenly crown of this bodhisattva is adorned with five hundred jewelled lotus-flowers, each having five hundred jewelled pedestals. On each pedestal appear the pure and resplendent lands of the Buddhas in the ten quarters with all their boundless and glorious features. "The mound on his head, shaped like a lotus-bud, has a jewelled vase in front. This is suffused with various lights which reveal all the activities of the Buddha. 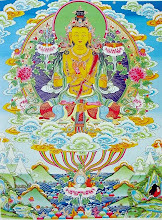 The rest of the characteristics of his body are [344b] exactly the same as Avalokiteshvara's. When this bodhisattva walks, all the worlds in the ten quarters shake. Wherever the earth trembles, five hundred kotis of jewelled flowers appear, each as beautiful and brilliant as a flower in the Land of Utmost Bliss. When this bodhisattva sits down, all the seven-jewelled lands, from that of the Buddha Golden Light in the nadir to that of the Buddha King of Light in the zenith, tremble simultaneously. From between these, manifested bodies of Amitayus, Avalokiteshvara, and Mahasthamaprapta, as innumerable as particles of dust, all assemble like clouds in the Land of Utmost Bliss, filling the entire sky. Sitting on lotus-seats, they expound the wonderful Dharma to save suffering beings. To visualize thus is known as the contemplation of Mahasthamaprapta Bodhisattva, and is also called the contemplation of Mahasthamaprapta's physical characteristics. 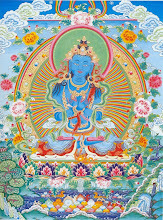 To visualize that bodhisattva in this way is known as the eleventh contemplation. It extinguishes the evil karma which one has committed during immeasurable and uncountable kalpas of Samsara. Those who practice this contemplation will no longer be subject to birth from the womb. They can journey to the pure and exquisite lands of the Buddhas. 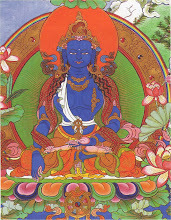 These contemplations are called the complete contemplations of Avalokiteshvara and Mahasthamaprapta. To practice in this way is called the correct contemplation, and to practice otherwise is incorrect." The Buddha said to Ananda and Vaidehi, "After you have contemplated thus, next visualize yourself as born in the Western Land of Utmost Bliss sitting cross-legged upon a lotus-flower. Visualize this lotus-flower as closed; as it opens, five hundred rays of colored light illuminate your body; then your eyes are open and you see Buddhas and bodhisattvas filling the sky and hear the sounds of the water, birds and trees, and the voices of the Buddhas all expounding the wonderful Dharma in accord with the twelve divisions of the scriptures. When you rise from meditation, keep those things in mind and do not forget them. Seeing them thus is called the visualization of the Land of Utmost Bliss of the Buddha Amitayus. This is the comprehensive visualization, and is known as the twelfth contemplation. "Innumerable transformed bodies of Amitayus, together with those of Avalokiteshvara and Mahasthamaprapta, will always accompany those who contemplate thus. To practice in this way is called the correct contemplation, and to practice otherwise is incorrect." "Amitayus, exercising supernatural powers at will, can freely manifest his various forms in the lands of the ten quarters. At times he may appear as a large figure, filling the whole sky; at other times as a small figure, only sixteen or eight feet high. The figures which he manifests are all of the color of pure gold. The transformed Buddhas and jewelled lotus-flowers in the aureole of each manifested form are like those described above. "The Bodhisattvas Avalokiteshvara and Mahasthamaprapta have a similar appearance, wherever they are. Sentient beings can only tell one from the other by looking at the emblems on their heads. These two bodhisattvas assist Amitayus in saving all beings everywhere. This is the miscellaneous visualization, and is known as the thirteenth contemplation. To practice in this way is called the correct contemplation, and to practice otherwise is incorrect." The Buddha said to Ananda and Vaidehi, "Those born in the Western Land are of nine grades. Those who attain birth on the highest level of the highest grade are sentient beings who resolve to be born in that land, awaken the three kinds of faith and so are born there. What are the three? They are, first, the sincere faith; second, the deep faith; and third, the faith that seeks birth there by transferring one's merit. Those who have these three kinds of faith will certainly be born there. "There are three other kinds of sentient beings who also attain birth. Who are the three? They are, first, those who have a compassionate heart, abstain from killing and observe the precepts; second, those who chant the Mahayana sutras of greater scope; and third, those who practice the six forms of mindfulness. They aspire to be born in that Buddha-land by transferring there the merit of practice. With the merit acquired from doing these acts for one to seven days, they attain birth. "When an aspirant is about to be born in that land through dedicated and undaunted practices, the Tathagata Amitayus arrives together with Avalokiteshvara, Mahasthamaprapta, innumerable transformed Buddhas, a great assembly of a hundred thousand monks and shravakas and innumerable devas in seven-jewelled palaces. The Bodhisattva Avalokiteshvara, carrying a vajra-seat, together with the Bodhisattva Mahasthamaprapta, approaches the aspirant. Amitayus releases a great flood of light which illuminates the aspirant's body and, along with the bodhisattvas, extends his hands in welcome. Avalokiteshvara and Mahasthamaprapta, together with innumerable bodhisattvas, praise and encourage the aspirant. Seeing this, the aspirant rejoices so greatly as to dance. Then he sees himself sitting on the vajra-seat, and following the Buddha, is born into that land in the time it takes to snap one's fingers. "After being born in that land, he sees the Buddha's body complete with all its physical characteristics and also [345a] the bodies of the bodhisattvas equally complete with all their physical characteristics. Hearing the discourse on the wonderful Dharma sent forth by the light and the jewelled trees, he then reaches the insight into the non-arising of all dharmas. 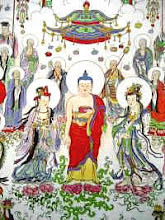 In a single moment, he visits and worships all the Buddhas of the ten quarters and receives from each of them the prediction of his future Buddhahood. Returning to the Pure Land, he is endowed with innumerable hundreds of thousands of dharanis. Such a person is called one who attains birth on the highest level of the highest grade. "Those who attain birth on the middle level of the highest grade, do not necessarily uphold and chant the sutras of greater scope, but comprehend the teachings of the Buddha so well that when they hear the supreme truths, they are not dismayed. They have deep faith in the law of karmic causes and effects and do not speak slightingly of the Mahayana. They transfer the merit acquired to the Land of Utmost Bliss, aspiring to be born there. "When such an aspirant is about to die, Amitayus appears before him, surrounded by Avalokiteshvara, Mahasthamaprapta and innumerable sages and attendants, carrying a purple-gold lotus-seat. The Buddha praises him, saying, 'Son of the Dharma, because you have practiced the Mahayana and appreciate the supreme truths, I have come to welcome you.' So saying, he and a thousand transformed Buddhas extend their hands all at once towards the aspirant, who, seeing himself sitting on the purple-gold seat, joins his palms and praises the Buddhas. In an instant, he is born in a seven-jewelled pond of that land. "The purple-gold seat has become like a great jewelled flower, which opens after one night. The body of the aspirant has become the color of purple-gold, and beneath his feet are seven-jewelled lotus-flowers. The Buddha and bodhisattvas together release a flood of light which illuminates the aspirant's body. His eyes open, and because of the store of merit from his previous life, he hears voices everywhere expounding only the most profound and supreme truths. Descending from his golden seat, he bows with joined palms and praises the Buddha, the World-Honored One. After seven days, he immediately reaches the Stage of Non-retrogression for realizing the highest, perfect Enlightenment. He is also able to fly in the ten quarters, as he wishes, to revere all the Buddhas and learn various samadhis from them. After the lapse of a smaller kalpa, he attains the insight into the non-arising of all dharmas and receives from each Buddha the prediction of his future Buddhahood. Such a person is called one who attains birth on the middle level of the highest grade. "Those who attain birth on the lowest level of the highest grade likewise accept the law of karmic causes and effects, do not speak slightingly of the Mahayana and awaken aspiration for the highest Enlightenment. They transfer the merit acquired to the Land of Utmost Bliss, aspiring to be born there. "When he has viewed all this, the aspirant finds himself seated upon a golden lotus-flower, which then closes. Following the World-Honored One, he immediately attains birth on a seven-jewelled pond. After a day and night, the lotus-flower [345b] opens and, within seven days, the aspirant beholds the Buddha. Although he sees the Buddha's body, he is still unable to discern his physical characteristics and marks clearly. But after three weeks he sees them distinctly, and also hears all the sounds and voices proclaiming the wonderful Dharma. Then he can travel in all the ten quarters to make offerings to the Buddhas and hear their profound teachings. 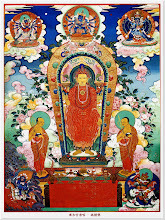 After three smaller kalpas he acquires clear understanding of the one hundred dharmas and dwells in the Stage of Joy. Such a person is called one who attains birth on the lowest level of the highest grade. These three together are known as the contemplation of the highest grade of aspirants, and the fourteenth contemplation. To practice in this way is called the correct contemplation, and to practice otherwise is incorrect." 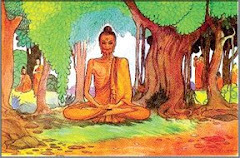 The Buddha said to Ananda and Vaidehi, "Those who attain birth on the highest level of the middle grade are the sentient beings who keep the five precepts, observe the eight abstinences, practice in compliance with various precepts, and abstain from committing the five gravest offenses and other transgressions. They transfer the merit acquired to the Western Land of Utmost Bliss, aspiring to be born there. "When such a person is about to die, Amitayus appears before him, surrounded by a host of monks and radiating a golden light. He then expounds the truth of suffering, emptiness, impermanence and no-self, and praises renunciation of the world as the way to escape from suffering. "Seeing this, the aspirant greatly rejoices and finds himself seated upon a lotus-flower. He kneels down, joins his palms and worships the Buddha. Before he raises his head, he attains birth in the Land of Utmost Bliss, where his lotus-bud soon opens. When the flower opens, he hears various sounds and voices extolling the Four Noble Truths. He immediately attains Arhatship, acquires the three kinds of transcendent knowledge and the six supernatural powers, and realizes the eight samadhis of emancipation. Such a person is called one who attains birth on the highest level of the middle grade. "Those who attain birth on the middle level of the middle grade are the sentient beings who observe for at least a day and night the eight abstinences, the precepts for a novice or the complete precepts of a monk or a nun, and do not violate any of the rules of conduct. They transfer the merit acquired to the Land of Utmost Bliss, aspiring to be born there. "Those who attain birth on the lowest level of the middle grade are good men and women who are dutiful to and care for their parents and do benevolent deeds for others. When such a person is about to die, he may meet a good teacher, who fully explains to him the bliss of the land of Amitayus and the Forty-eight Great Vows of the Bhiksu Dharmakara. Having heard this, he dies and in the short time it takes a strong man to bend and straighten his arm, he attains birth in the Western Land of Utmost Bliss. 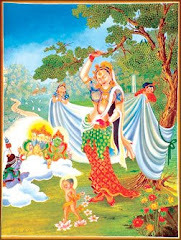 Seven days after his birth there, he meets Avalokiteshvara and Mahasthamaprapta, rejoices at hearing the Dharma from them and so reaches the Stage of a Stream-Winner. After one smaller kalpa, he becomes an Arhat. Such a person is called one who attains birth on the lowest level of the middle grade. These three together are known as the contemplation of the middle grade of aspirants and the fifteenth contemplation. To practice in this way is called the correct contemplation, and to practice otherwise is incorrect." The Buddha said to Ananda and Vaidehi, "Those who attain birth on the highest level of the lowest grade are the sentient beings who commit various evil acts but do not slander the Mahayana sutras of greater scope. When a foolish person such as this, who has committed much evil but feels no remorse, is about to die, he may meet a good teacher, who praises the titles of the twelve divisions of the Mahayana scriptures. By hearing these sutra-titles, he is released from the burden of evil karma which he has accumulated during a thousand kalpas. Furthermore, this wise teacher advises him to join his palms and call, 'Homage to Amitayus Buddha' [Na-mo-o-mi-t'o-fo].' Calling the name of the Buddha extinguishes the evil karma that the dying person has committed during fifty kotis of kalpas of Samsara. "The Buddha then sends his transformed body and those of Avalokiteshvara and Mahasthamaprapta to the aspirant; they praise him, saying, 'Well done, man of good deeds! By calling the Name of the Buddha your evil karma has been extinguished, and so we have come to welcome you.' When these words are uttered, the aspirant sees a flood of light from that transformed Buddha fill his room. Having seen this, he rejoices and dies. Seated on a jewelled lotus-flower, he follows the transformed Buddha and is born on a jewelled pond. In seven weeks the lotus-bud opens and Avalokiteshvara, the Bodhisattva of Great Compassion, and Mahasthamaprapta appear before him, releasing great floods of light, and explain to him the extremely profound teachings of the twelve divisions of the scriptures. Having heard these, the aspirant accepts them in faith, and awakens aspiration for the highest Enlightenment. After ten smaller kalpas, he acquires clear understanding of the one hundred dharmas and enters the First Stage of Bodhisattvahood. Such a person is called one who attains birth on the highest level of the lowest grade. Thus he is born by hearing the Name of the Buddha, the Dharma and the Sangha -- that is, the Three Treasures." The Buddha said to Ananda and Vaidehi, "Those who attain birth on the middle level of the lowest grade are the sentient beings who violate the five precepts, the eight precepts or the complete precepts of a monk or a nun. A foolish person such as these steals from the Sangha or takes the personal belongings of monks, or preaches the Dharma with impure motives but feels no remorse. Thus he [346a] defiles himself by evil karma, and because of this he will fall into hell. "When he is about to die and the flames of hell suddenly close in on him, he may meet a good teacher, who compassionately explains to him the ten supernal powers of Amitayus, fully describing the majestic power of the light of that Buddha, his virtues in the observance of the precepts, meditation, wisdom, emancipation and knowledge of emancipation. When he has heard this, the evil karma which he has committed during eighty kotis of kalpas of Samsara are extinguished; thus, the fierce flames of hell turn into cool and refreshing breezes, wafting heavenly flowers. On each flower is a transformed Buddha accompanied by bodhisattvas welcoming him. 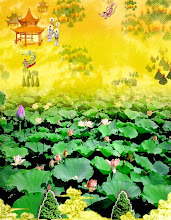 "In an instant, he attains birth within a lotus-bud on a seven-jewelled pond. After six kalpas the lotus-bud opens, and then Avalokiteshvara and Mahasthamaprapta comfort him with their noble voices and teach him profound Mahayana sutras. Upon hearing these, he immediately awakens aspiration for the highest Enlightenment. Such a person is called one who attains birth on the middle level of the lowest grade." The Buddha said to Ananda and Vaidehi, "Those who attain birth on the lowest level of the lowest grade are the sentient beings who commit such evils as the five gravest offenses, the ten evil acts and all kinds of immorality. Owing to such evil karma, the fool like this will fall into evil realms and suffer endless agony for many kalpas. When he is about to die, he may meet a good teacher, who consoles him in various ways, teaching him the wonderful Dharma and urging him to be mindful of the Buddha; but he is too tormented by pain to do so. The good teacher then advises him, 'If you cannot concentrate on the Buddha, then you should say instead, Homage to Amitayus Buddha.' In this way, he sincerely and continuously says 'Homage to Amitayus Buddha' [Na-mo-o-mi-t'o-fo] ten times. Because he calls the Buddha's Name, with each repetition, the evil karma which he has committed during eighty kotis of kalpas of Samsara is extinguished. When he comes to die, he sees before him a golden lotus-flower like the disk of the sun, and in an instant he is born within a lotus-bud in the Land of Utmost Bliss. After twelve great kalpas the lotus-bud opens. When the flower opens, Avalokiteshvara and Mahasthamaprapta teach him with voices of great compassion the method of extinguishing evil karma through the realization of Suchness of all dharmas. Hearing this, he rejoices and immediately awakens aspiration for Enlightenment. Such a person is called one who attains birth on the lowest level of the lowest grade. These three together are known as the contemplation of the lowest grade of aspirants and the sixteenth contemplation." As the Buddha delivered these words, Vaidehi and her five hundred female attendants listened to his teaching. Having envisioned the boundless features of the Land of Utmost Bliss, the Buddha (Amitayus) and the two bodhisattvas, Vaidehi rejoiced in her heart. Wonder-struck at this revelation, [346b] she attained great awakening with clarity of mind and reached the insight into the non-arising of all dharmas. Her five hundred female attendants awakened aspiration for the highest, perfect Enlightenment and desired to be born in that land. The World-Honored One gave all of them assurances that they would be born there and that they would then attain the Samadhi of Being in the Presence of All the Buddhas. Innumerable devas also awakened aspiration for the highest Enlightenment. Then Ananda rose from his seat, stepped forward, and said to the Buddha, "World-Honored One, what should we call this sutra and how should we receive and retain the essentials of its teaching?" 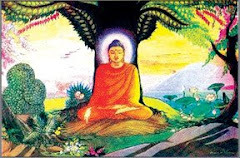 The Buddha answered, "Ananda, this sutra is called the Visualization of the Land of Utmost Bliss, of the Buddha Amitayus, and of the Bodhisattvas Avalokiteshvara and Mahasthamaprapta. It is also called the Purification and Elimination of Karmic Hindrances for Attaining Birth in the Presence of All the Buddhas. Hold fast to this sutra and do not forget it. Those who practice this samadhi will be able to see, during their lifetime, the Buddha Amitayus and the two Mahasattvas. If good men or women simply hear the Name of this Buddha or the names of those two bodhisattvas, the evil karma which they have committed during innumerable kalpas of Samsara will be extinguished. And so, how much more merit will they acquire if they concentrate on them! You should know that all who are mindful of that Buddha are like white lotus-flowers among humankind; the Bodhisattvas Avalokiteshvara and Mahasthamaprapta become their good friends. 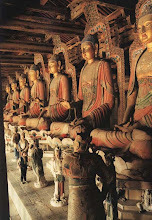 They will sit in the place of Enlightenment and be born into the family of the Buddhas." The Buddha further said to Ananda, "Bear these words well in mind. To bear these words in mind means to hold fast to the Name of the Buddha Amitayus." 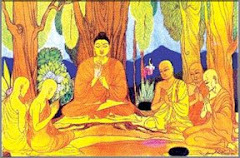 When the Buddha had spoken thus, the Venerable Mahamaudgalyayana, Venerable Ananda, Vaidehi and all the others greatly rejoiced to hear the Buddha's discourse. Then the World-Honored One returned to the Vulture Peak through the air. There Ananda fully explained to the assembly what had happened. Innumerable humans, devas, nagas, yaksas and all the other beings greatly rejoiced to hear the Buddha's teaching. Having worshipped the World-Honored One, they departed.